Folding exercise bikes are top-ranked in lists of modern fitness machines available in the global markets. Fitness Exercise bikes are excellent for all types of exertion, if you either want to perform a little cardio, or if you prefer HIIT (High Intensity Interval Training). The popularity of the XTERRA Fitness FB350 Folding exercise bike is owed to its portability and ease of use, because latest costumer trends dictate that a machine should be light, durable, and above all portable, and must not take up a lot of bulky space. This machine enjoys very favourable ratings by both professionals and novices of the fitness industry alike. This is in part due to its list of impressive features, and because it delivers an easy, accessible way to tone your leg, calf and ankle muscles, all within the comfort and convenience of your own home. 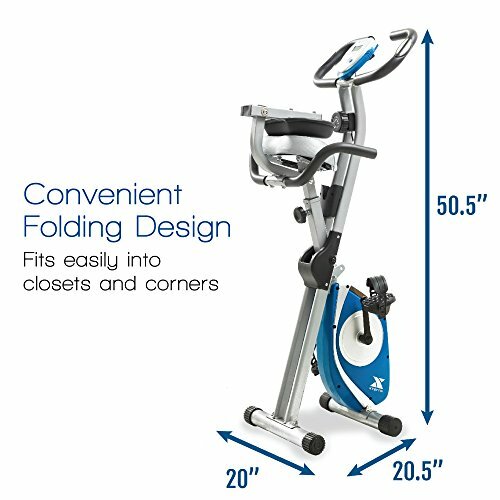 The XTERRA Fitness FB350 Folding exercise bike measures at dimensions of 50.5” x 20.5” x 20” when folded, meaning you can easily store it away in your tiny closet or store when not needed, which is made easier with the built-in transport wheels. The bike weighs 42.3 lbs and can sustain a maximum weight of 220 lbs, although there have been customer reviews claiming weight exceeding the 220lbs limit is also very easily sustained. The bike has a solid, X-frame design which is both minimal and efficient, meaning your centre of gravity is firmly maintained. The frame is made of thick steel tubing that provides the necessary durability and strength as your exercise. The bike features a silent-belt drive system, which ensures no disturbing noise for any by-standers as you operate the machine. The bike does not come with levellers, which means you must ensure assembling it on a level surface before working out so that there is no wobbling. The lower back seat comes padded with a back pad, and thick padded seat, as well as padded seat handles, all meant to ensure a comfortable user-experience by allowing a secondary seat position which will keep you cycling for longer. The FB350 comes in two colours; namely silver and blue. A fully functional, oversized 2” x 1” LCD screen helps you keep track of your exercise readings by monitoring total speed, distance covered, elapsed time, total number of calories burned, as well as pulse- which is measured by handlebar mounted pulse sensors. . No track progress of your workout is going to get missed with these readings displayed in front of you. Apart from that, the bike has a seat that is firmly padded and an ergonomic angle for the back ensures your workout will be a comfortable one. A knob found on the base of the frame that connects the seat to the rest of the bike can be turned which in turn will help you adjust the seat. This helps accommodate users of varying heights. The FB350 is a well-rounded bike which offers a comprehensive list of features, even for its minimal price tag. It offers 8 levels of resistance, controlled manually by a knob, giving you ultimate control over varying the intensity of your workout. The knob affects magnetic resistance, which can be controlled so that your legs have to exert more or less depending on your choice. The magnetic resistance also offers a smooth, fluid and noiseless operation of the machine. The pedal crank is made of 3-pieces, for everlasting durability, and adjustable straps on the foot pedals also make your pedalling more effective, especially with its secure, non-slip feature. 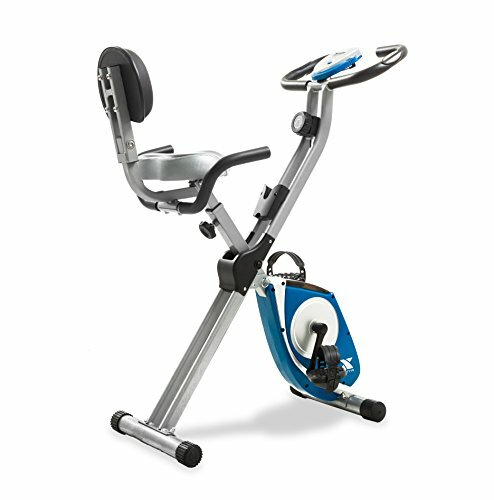 The FB350 bike also comes with a convenient accessory-holder, so you can put your phone, iPod or remote-control right with you as you exercise. The XTERRA Fitness FB 350 Folding Exercise Bike is a machine that has enjoyed considerable success and popularity in the fitness market, partly due to its affordable price and impressive list of features, especially the noise-free magnetic resistance it offers, as well as its steel-tube X-frame which is both light and durable, and let’s not forget the ease of portability and storage which is a big winner for this XTERRA model. Although it lacks some flashy features of high-end, pricier models –understandably so due to its low price- its straightforward and minimalistic design is a convincing buying point for many of its potential customers. 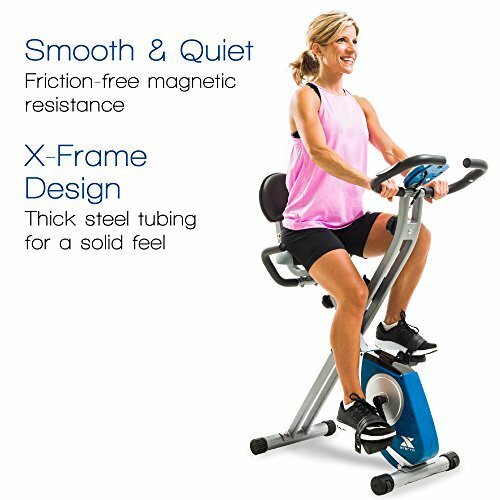 A well designed exercise bike that aims to bring your personal life a refreshing and comfortable workout.